Behold the Octopus Weekender – the analogue iPod, complete with storage compartment. When the iPhone came out in 2007, it ushered in the age of the smartphone. A whole range of separate devices – camera, phone, music player, watch and alarm clock – suddenly replaced with something you could slip in your pocket. The small size and convenience of the iPhone made more than one commentator at the time imagine the analogue equivalent you would have needed to carry around with you; camera, clock, wristwatch, radio – and don’t forget the flashlight if you’re fumbling with your keys late at night. Except there was an analogue equivalent of the iPhone – minus, crucially, the ability to make phone calls. Out of Harrisburg, Kentucky in the mid-1980s came a device called the Octopus Weekender. It was like a Swiss Army Knife without all the sharp, pointy bits. The Octopus Weekender boasted a 110-format camera, a clock with alarm settings, stopwatch, an AM/FM radio and a flashlight. It even had a storage compartment. All of this was contained in an object that looked like a miniaturised 1960s radio. 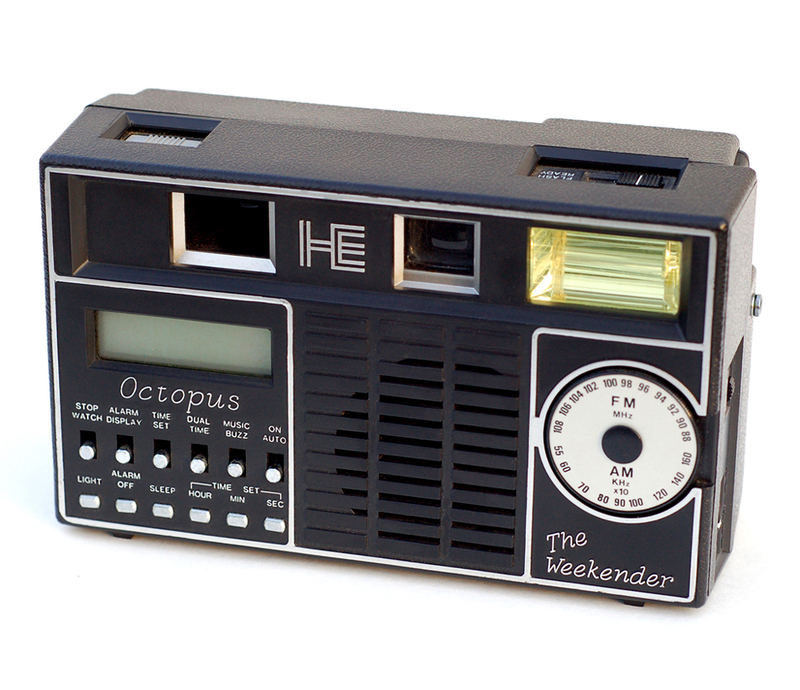 The Octopus Weekender was made by a company called Hendren Enterprises, and they guessed that what the 80s vacationing photographer really wanted was an all-in-one device that could take the place of half-a-dozen devices. Nevermind that the 110 format was one best suited to toy cameras than one expected to record once-in-lifetime holiday (with respect to the Pentax Auto 110). But the analogy to an all in one digital device – if not the iPhone then perhaps the fondly remembered iPod Touch – is not just the stuff of clickbait headlines. This really was a revolutionary device; an eight-in-one object in an age of analogue tech. But, as a post on Sub Club points out, the Weekender was a failure – possibly as a result of poor advertising, or high cost. But like the iPad and iPhone a quarter of a century later it is testament to the ceaselessly innovative nature of American industry – but there is also something slightly melancholic about it. A decade later and something like the Octopus Weekender would have been churned out in the factories of China of Hong Kong; this was, proudly, American made. The small amount of information about the Weekender on the web shows that the Weekender did not catapult Hendren Enterprises into the big time, according to John Kratz, whose image of the Octopus Weekender on Flickr is one of the few on the internet. Hendren’s attempt to trademark the name Weekender lapsed in 1990. The Weekender itself had ceased production after only a few months. By then, the 110 format was old hat, soon to be replaced by APS. As as far as we know, never again did someone try to make a camera with a flashlight and a storage compartment attached. Many thanks to John Kratz for the use of the photo of an Octopus Weekender from his personal collection.